Finds small leaks in crude MCHM (4-methylcyclohexanemethanol) chemical storage tanks before they can lead to catastrophic spills! Allows easy detection and tracing of chemical spills in soil and water, quickly determining and limiting the extent of any possible contamination. Ideal as part of a comprehensive preventive maintenance program! User Friendly − Just add a small amount of M-GLO™ fluorescent dye to the chemical storage tank, and circulate it thoroughly to mix. When the tank and piping are scanned with a high-intensity long-wave UV (365 nm) inspection lamp, all leak sites will glow bright yellow. Versatile − Pinpoints the exact source of even the smallest, most elusive leaks! Cost Effective − Highly concentrated formulation. One gallon (3.8 L) of dye treats 6,400 gallons (24,226 L) of crude MCHM. While the legal, financial, environmental and health-related impact has yet to be fully calculated in the aftermath of this devastating chemical spill, the initial clean-up costs to the business are known to have exceeded $800,000 in the first week alone. Fines and litigation costs have since forced the company to declare bankruptcy. The renewed demand for stricter safety and environmental regulations in the wake this incident will require chemical storage facilities to implement more comprehensive leak detection and preventive maintenance programs. That’s why we developed M-GLO fluorescent leak detection dye! 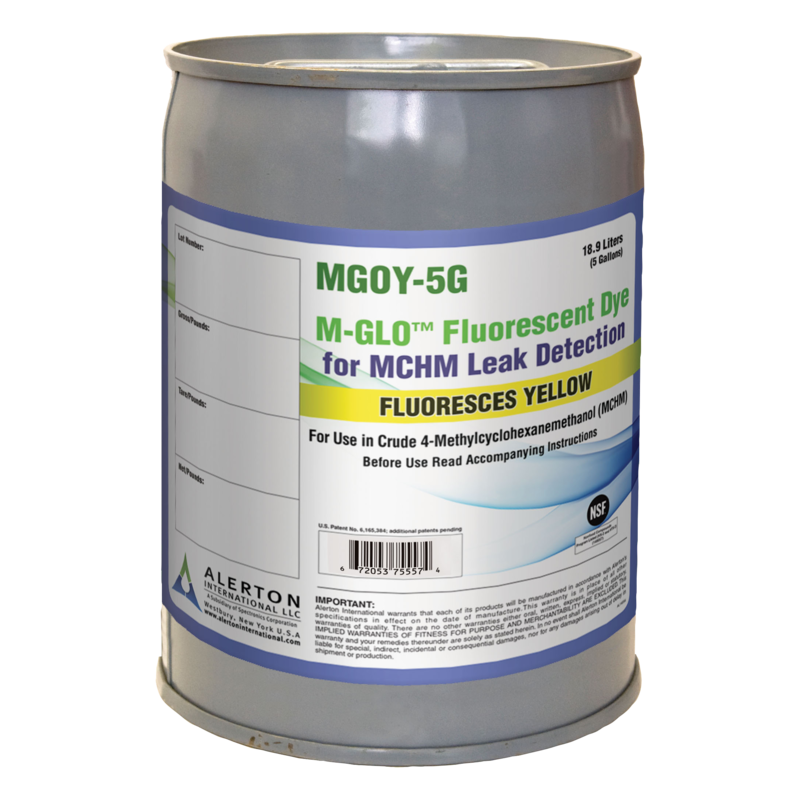 When added to MCHM chemical storage tanks, M-GLO fluorescent dye provides fast and easy detection of even the smallest leaks. In the event of a spill, M-GLO dye can also help trace its path and limit the extent of contamination into soil and water.